The condition is unique to cats and is characterized by an area of corneal degeneration with brown pigmentation. Yes. Persians, Himalayans, Siamese, and Burmese cats are diagnosed with the disorder most frequently. However, any breed can be affected. Although the cause is unknown, there is usually a history of corneal ulceration, irritation, and/ocular feline herpes virus infection. Squinting and tearing with a brown tear-stain are common. The are of corneal degeneration appears as a brown "spot" on the surface of the eye, which can vary in size and depth in the cornea. Surgical treatment is almost always necessary. Will The Condition Come Back? The risk of recurrence is reduced when the entire corneal sequestrum is excised and the corneal defect is reconstructed with a grafting procedure. 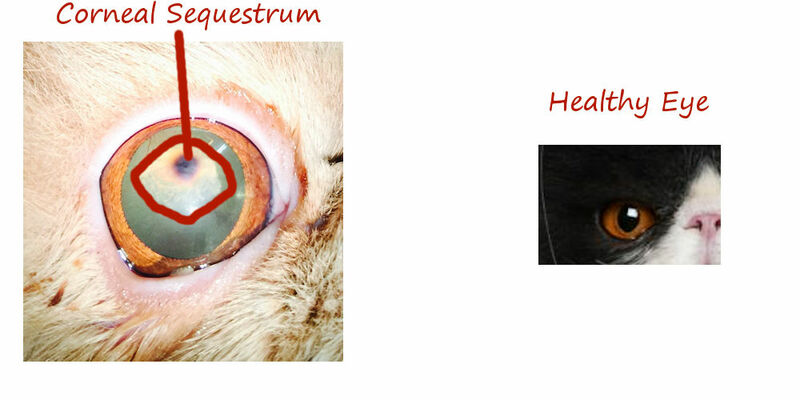 A sequestrum may develop in the other eye.